Elvis anniversaries—there have been a bunch of them noted and celebrated to various degrees in recent years. In 2004 we had the 50th anniversary of Elvis’s first commercial recording, “That’s All Right.” The next year marked 70 years since his birth. The year 2006 featured multiple anniversaries, including Elvis’s first #1 record, his first movie, and his appearances on the Sullivan show. Then in 2007 we remembered the 50th anniversaries of Elvis’s gold lamé suit and the films Jailhouse Rock and Loving You. (That year, however, Elvis Presley Enterprises chose to focus on the 30th anniversary of Elvis’s death.) In 2008 we recalled both Elvis’s 1958 entry into the army and his 1968 TV special. In 2009 and the big anniversary push seemed to be Elvis’s return to live performing in Las Vegas 40 years ago. I use the term “push” because all of these anniversaries are perfect themes for EPE to use in promoting their Presley merchandise. And the perfect product to fit all the anniversaries is the Teddy Bear. Of course, the cuddly toy has a perpetual connection to Elvis thanks to his charting topping record in 1957. 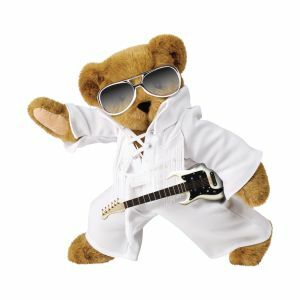 Just by changing the bear’s outfit, EPE has been able to align it with each new Elvis anniversary. They’ve sold the same bear in gold lamé, jailhouse stripes, army fatigues, and black leather. 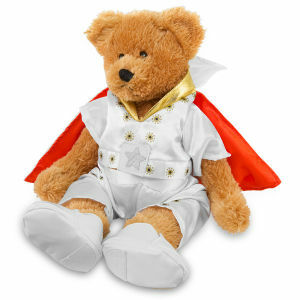 And in 2009 year all they had to do was slap a little jumpsuit on the bear, and they created the perfect collectible to remember Elvis’s 1969 Las Vegas debut. Now, those of you who are regular readers of this blog know I don’t often deal with Elvis collectibles. It’s certainly not that I look down upon those who enjoy accumulating Elvis items. It’s just that this is elvis-history-blog.com, and I see collectibles as playing a minor role in the “history” of Elvis Presley. Neither is it my intent to demean EPE, which is ultimately a business that must sell Elvis collectibles to thrive. In fact, in addition to selling doodads, EPE offers some services that are very useful to fans like me who are interested in Elvis history. One of those is the “Elvis Insiders” club that EPE administers. I became a member in 2002, the year the group started. From time to time, I'd scroll through the Insiders’ on-line forum searching for interesting discussion threads. Occasionally, the site administrator posed a question and invited members to respond. In 2009 a thoughtful question drew some thoughtful replies. The question—“What effect do you think Elvis’ years performing in Las Vegas had on his career?” Of course, many responses portrayed Elvis as being like a Saint presiding over the faithful masses who made their pilgrimage to the desert. However, many others offered more balanced views of Elvis’s work during those years. They were able to see how the Vegas stage influenced Elvis’s career in both positive and negative ways. Here are a few examples. Claudia made a couple of important observations. 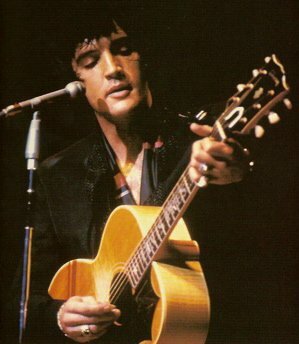 First, by returning to live performances, Elvis made himself available to his fans once again. During the Hollywood years, most of his fans, including me, had no hope of ever seeing Elvis in any venue other than a movie theater. Without doubt his popularity began to dwindle away during the middle sixties. His return to the stage revitalized his career. It reawakened many of his old fans and won him multitudes of new ones. I never saw Elvis perform in Las Vegas. (Once in 1970, however, I was visiting my father in Las Vegas while Elvis was appearing there. I couldn’t get in, of course, but one night I went to the International, stood outside the closed showroom doors, and faintly heard Elvis singing inside.) Later, when he went on the road, I was able to see him perform, and it is something I’ll never forget, something that would never have been possible without him first appearing in Las Vegas. But, as Claudia pointed out, instead of focusing solely on live performances, Elvis’s career would have been better served had he focused on a variety of “creative challenges.” In the 1950s Elvis performed on stage often, but he also appeared on TV occasionally and made several movies. When he came out of the army in 1960, however, he made the mistake of concentrating solely on making films. There were no multiple TV appearances or annual concert tours. That course eventually drained his creativity and enthusiasm. Unfortunately, when he returned to live performing, Elvis made the same mistake. For the rest of his life, he focused on concert work only, forsaking all other “creative challenges” open to him. That decision—and make no mistake, it was Elvis’s decision alone—was inevitably fatal to his creative spirit. "As the years moved along the show with its repetition and high frequency of performances must have felt to Elvis somewhat like his once promising movie career—stuck."